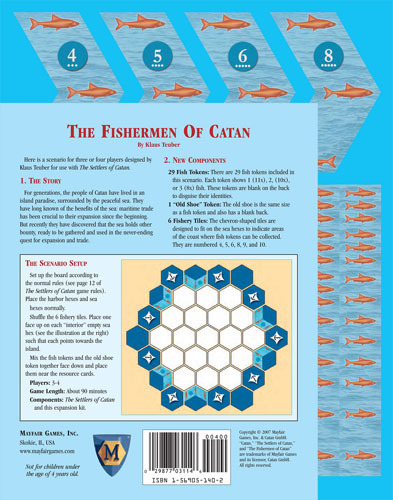 For generations, the people of Catan have lived in an island paradise, surrounded by the peaceful sea. They have long known of the benefits of the sea: maritime trade has been crucial to their expansion since the beginning. But recently they have discovered that the sea holds other bounty, ready to be gathered and used in the never-ending quest for expansion and trade. The addition to fish as another resource is awesome this, just adding a little to the game but yet changing it alot.